Are you looking for a faster recovery from Hammertoe Surgery? How does minimally invasive hammertoe surgery differ from traditional hammertoe surgery? 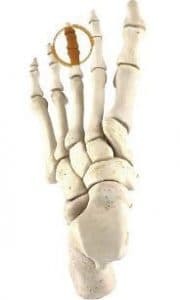 Minimally invasive hammertoe surgery is performed using a small implant called the Smart Toe II which removes the need for any external k-wires to be placed in the toe as is required in traditional hammertoe correction. The Smart Toe II implant is made from a nitinol memometal which expands when exposed to body temperature to provides compression and superior stability across the toe surgery site. The implant stays in the toe joint permanently and does not usually have to be removed after surgery. What are the advantages of minimally invasive hammertoe surgery over traditional hammertoe surgery? Faster transition to normal footwear and activity. What is the recovery from Smart Toe hammertoe surgery? Patients who have minimally invasive hammertoe surgery performed are generally quicker to return to normal activities compared to those who have traditional hammertoe surgery. This is because the Smart Toe II implant does not require the use of external wires to maintain toe alignment after surgery. Patients are allowed to weightbear immediately after surgery in a post-operative sandal which needs to be worn for at least 2 weeks. Once it is safe to remove the dressing from the toe, patients are generally allowed to transition back to a sandal or supportive sneaker, and are required to use a compressive bandage on their toe for approximately 6 weeks. This website is intended for general information purposes only. Any surgical or invasive procedure carries risks. Before proceeding, you should seek a second opinion from an appropriately qualified health practitioner. For more information on minimally invasive hammertoe surgery in Perth, follow the link to make an appointment to see our specialist podiatric surgeon Dr. Andrew Knox.